We are constantly being asked to rate, describe, and provide information to help third parties, sometimes under the guise of improving customer experience – and always at the expense of our own time and effort. 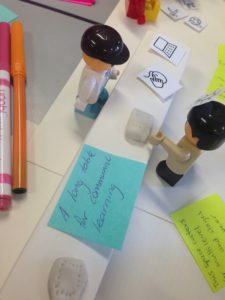 As a project investigating how teachers enable learning most effectively in innovative learning environments, the ILETC team wanted to thoroughly understand the attitudes and experience of teachers, in richer and more engaging ways than a survey or an email. This ARC linkage project ultimately seeks to assist and support teachers, but we were also interested in how to give back to participants as the project progresses. We wanted to create workshops that encouraged everyone to reflect and share their experiences and insights with us in ways that could support the research and data collection in mutually beneficially ways. Throughout this early research phase we have been challenging our assumptions and wanted to learn as much as possible from the experiences of teachers who are, after all the experts in their classrooms. Just as we were eager to learn from teachers’ experiences, we realized other teachers would benefit just as much from the chance to share stories, compare experiences and learn from each other’s successes and struggles. We decided to facilitate engaging and meaningful workshop experiences where the participants learned just as much as the researchers through the use of creative and playful methods associated with the field of design thinking. In simple terms, design thinking refers to creative strategies designers utilize during the process of designing. In recent years, design thinking has been used to consider issues and resolve problems more broadly than within professional design practice such as in business and the social sciences. 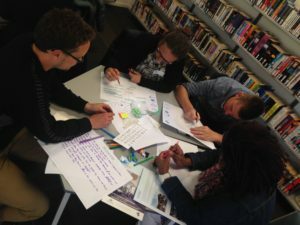 Led by Professor Lisa Grocott, each ILETC workshop was designed to include a creative, highly participatory activity designed to examine a specific research question. 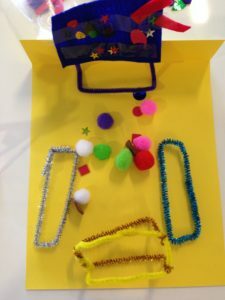 Participants modeled classrooms with craft materials, organized ideas on post-its, made mind maps, created and compared made up teacher characters, and even role-played with toy figures. 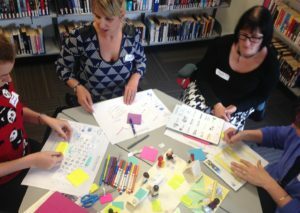 While it often looked like a primary school art class let loose, these methods of making knowledge visible provided the participants with a chance to personally reflect and create something tangible that they could then speak to as a group. This provided a natural catalyst for the countless stories being shared, lessons learned and tips being discussed. As we were photographing the models and visualizations that would become our data, it was gratifying to listen to many expressions of enjoyment, words of thanks, as well as hearing from the participants their appreciation in being able to learn from other teachers and “network with like-minded educators”. The methods of helping them visualize and discuss their stories and experiences not only provided us with rich and meaningful data. Responses from participants showed they, “loved the hands-on approach” and felt “the creative activities allowed for excellent discussions and idea generating.” The overwhelmingly positive responses are encouraging for us as we continue to evaluate and reflect on the data gathered, gaining insights by experts in the classroom—our teachers. Find out details of future workshops here. *The team from Monash Art Design and Architecture are Professor Lisa Grocott (lisa.grocott@monash.edu), Alli Edwards and Dion Tuckwell. Lisa is a part of the ILETC Chief Investigator team.